The NBCAM was founded in 1985 by AstraZeneca with the purpose of promoting breast cancer awareness, sharing information on the disease, and providing better access to screening services (mammograms). They also placed an emphasis on encouraging mammograms as the most valuable tool in the fight against breast cancer. Reason being….early detection is crucial! Their website (www.nbcam.org) has some great resources, including how to find a Mammography Center in your area. 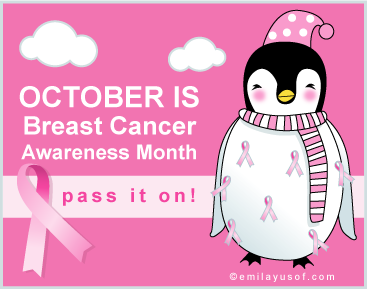 Breast Cancer Awareness is not just for people with cancer, its not just for women, and its not all done in one month. The prevalence of this disease is so abundant that almost everyone is affected. We would like to encourage everyone to go get screened, or at least to pass along the message to someone who should.You can browse our directory to find a Cancer Imaging and Screening facility near you. Also, we would love to hear about what you are doing this month…be it running, walking or skydiving for a cure. Please drop some comments below and let us know how you are making a difference!